Even upstairs, we often long for some outside space. Creating a balcony or roof terrace can not only provide a lovely place to read the papers on a weekend, but, even on a tiny scale, can make bedrooms and studies feel much more spacious and open. 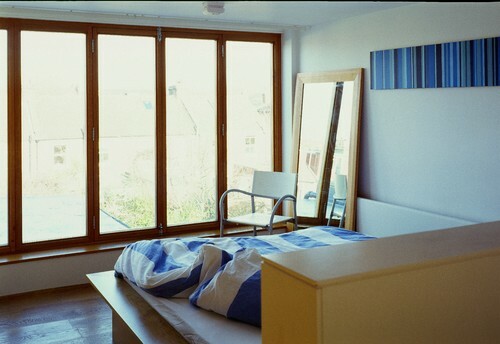 Even in a small loft bedroom, the extra sense of spaciousness between a straightforward window and some full-length glazed doors with a Juliet balcony is tremendous. In this example, the roof level restricted the ceiling height to only a fraction above 2m, which would have felt oppressive were it not for the glazing. To maximise the open effect, the balcony barrier (only just visible in this photo) is frameless glass. While usually modest in scale, Juliet balconies don’t necessarily have to be tiny. By being fitted with folding doors and a glass barrier, this extravagant example is not so much a window on the world as a CinemaScope panorama. Juliet balconies are numerous in the UK, because they can often be installed without a planning application, but it’s more difficult to get approval for projecting balconies, like this lightweight (relative to a masonry one) metal frame design. The sticking point is most commonly about the effect on neighbour privacy, but in circumstances where that’s not a factor, a small balcony like this can add tremendously to the attractiveness of a house from both outside and in. In this funky example, a loft has been converted and extended, but kept well back from the parapet wall to allow space for a small roof garden. 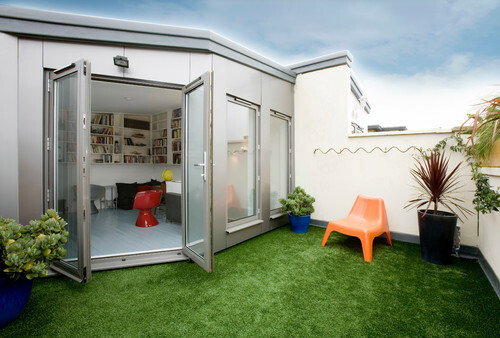 The style is deliberately playful, with artificial grass, metal cladding and colourful plastic chairs. 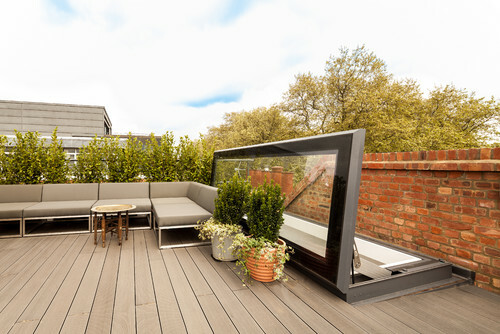 Take a tour of a London home with a surprising roof terrace. 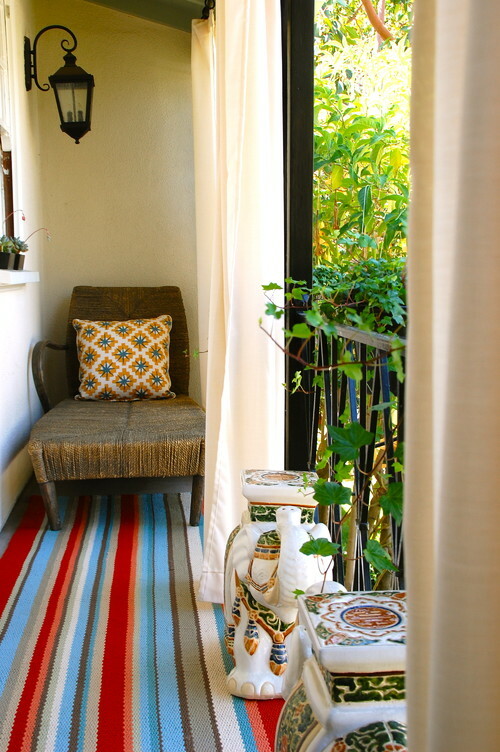 Opening up French doors onto a narrow balcony can brighten and lift even the smallest upper-floor space. Here, a tiny corridor to nowhere has become a relaxing spot for reading. 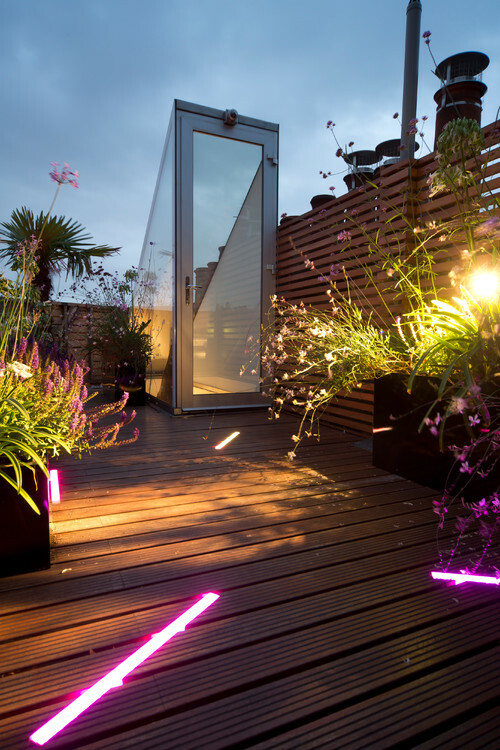 Don’t forget your outdoor lighting to keep your balcony bright for the evenings. With walk-on glazing widely available, it’s now possible to create a small roof terrace on the upper level while still drawing dramatic daylight down into the rooms below. 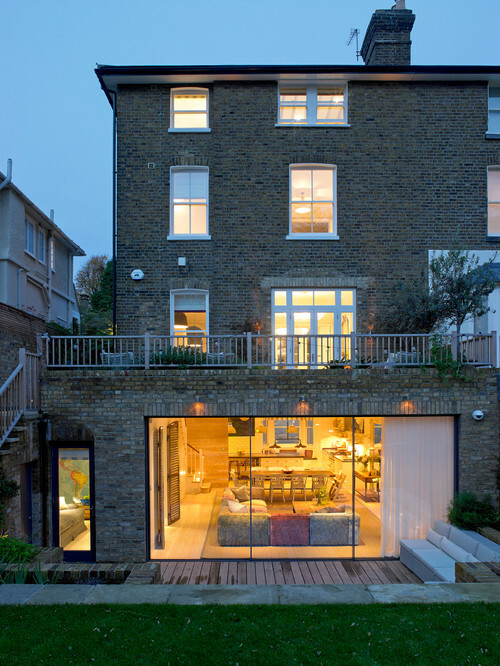 The addition of a ground-floor extension can also create the opportunity for a roof terrace or balcony at first-floor level. However, be aware that while the extension itself might fall within the realms of Permitted Development, the use of the roof space for a terrace would not come with that and would require Planning Permission. 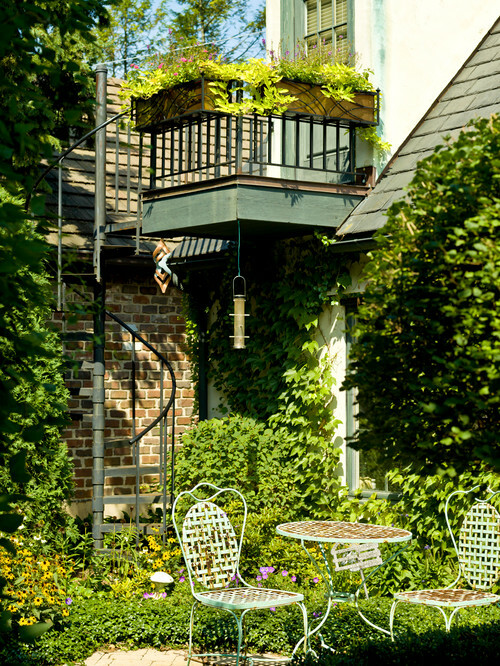 Even small extensions, such as these charming bay windows, can create balcony opportunities. While not particularly usable to sit out on, the enhanced sense of space in the first-floor rooms is in addition to the extra interest and modelling on the external elevation. A frequent problem can be how the top of the stairs up to a roof terrace is dealt with. 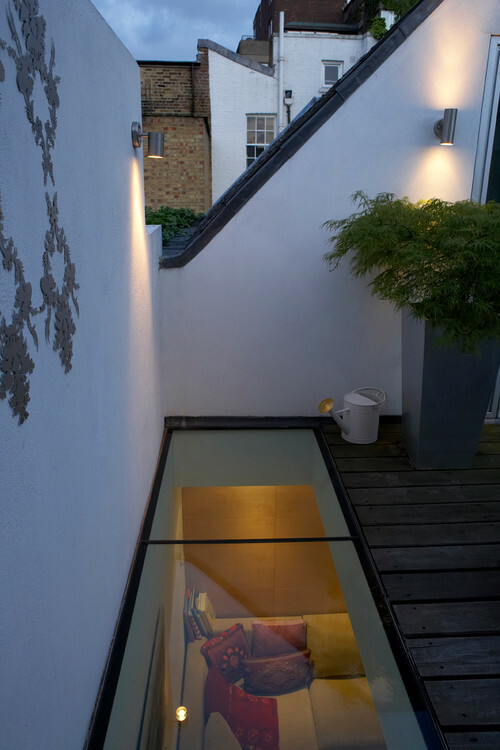 Here, a glass enclosure with a door allows the stairs to remain indoors while avoiding any bulky or visually intrusive construction. Another ingenious solution to this problem is a glass door on its side. Opened mechanically by a switch at the bottom of the stairs (it would be far too heavy to open manually), the cover lifts like a coffin lid, allowing access to the roof and forming a barrier to prevent anyone falling down the stairwell. A great advantage of this is that there’s no construction much above the terrace deck level, which can be a help when applying for permission. 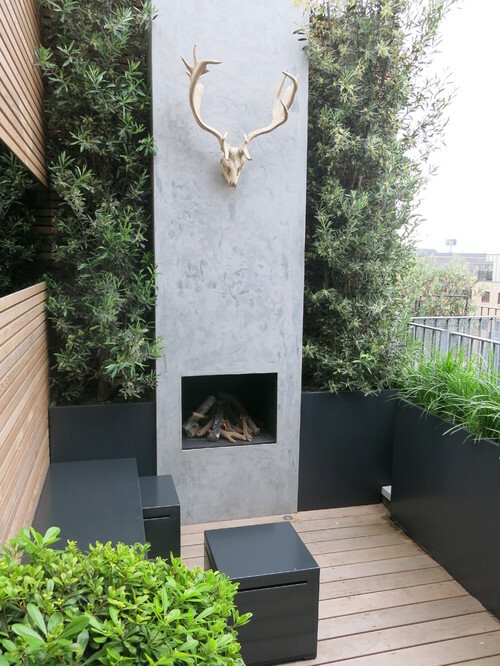 Chimneys are often a feature of roofscapes, so if your balcony or roof terrace is alongside a chimney stack, consider the possibility of using the available flues to form an outside fireplace for those clear but chilly evenings. While small, this perky little vantage point is elegant, with its little spiral staircase, and is softened by generous planting. Rooftops might feel quite exposed, but in some instances they can be very private spaces and offer opportunities to get away from life below – particularly if you can install a hot tub for relaxing! If you don’t have a roof suitable, it may be possible to build a simple structure to give you that rooftop feel. This large, covered outdoor space makes wonderful use of the corner beside the house and utilises very low-cost construction. 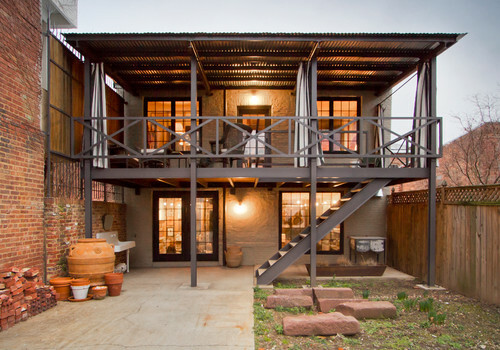 I love the little second-floor balcony that’s been squeezed in at the back of this house. 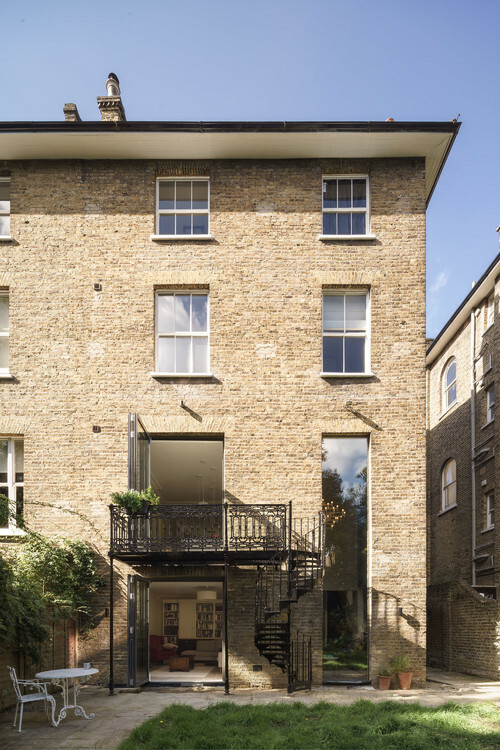 With large, contemporary glazed spaces on the floors below, the scale as you go up the house diminishes slowly, as if there’s a hierarchy to the building akin to its Victorian heart.